High 'Chance' shirt with 'Diverge' trousers blue, with white print suit. Small, rounded, soft collar. 5 white button fastening. Short sleeves with finished trim. the hem of the top section is very fine fabric folded over the hem with stitch detail. Shaped with stitch detail. Smocked panels at each side.Crystal attached at rear of neck. The trousers are panel constructed, wide legged. 2 pockets with metal stud detail at the top and botton of each pocket. 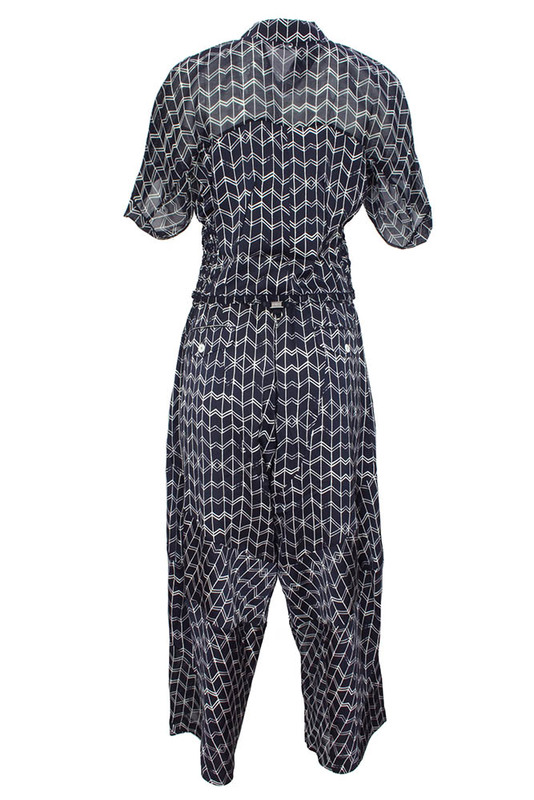 Elasticated ruched waist, with white drawstring. 2 rear pockets with flaps and button fastening. This is a stunning lightweight, Summer suit, very stylish and a cool as it gets!